Create the perfect roofline with an added touch that means so much, creative and custom finials in a wide range of sizes and styles. When you are completing a construction or home improvement project, you want to know that every detail is just right, and that everything builds towards a cohesive look. If you have a stunning roofline but need a little something extra, consider adding finials to your look! 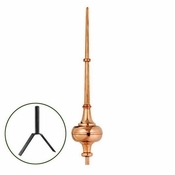 While small, finials can have a big impact on the overall presentation and they come in a wide variety of colors from black matte and glass, antique white, polished copper and brass and brushed nickel. 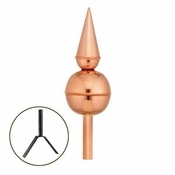 You are sure to find a roof finial that will catch your eye. Add some variety to the look of your roofline with decorative roof finials! Choose from a range of colors, styles and sizes so you are sure to find just the perfect look to mesh with your color scheme and visual direction. 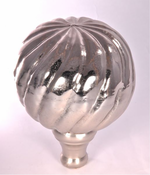 Finials add a graceful finishing touch to any rooftop, turret or cupola and keep things looking up as they bring the eye skyward and make a dramatic statement. 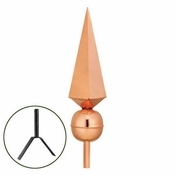 Finials can also be used in the yard or garden as a topiary or decorative sculpture. For over 35 years Good Directions copper finials have been unsurpassed in design, quality, and durability adding a graceful finishing touch to any rooftop, turret or cupola. 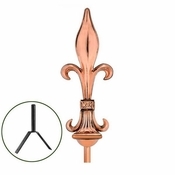 Our finials are made of pure copper and brass, and are supported by our industry exclusive Lifetime Warranty. 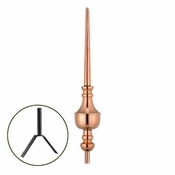 Finials come with a 4” copper globe, 18” directionals and a powder coated steel rod. Enhance the curb appeal and appearance of your home by choosing your finial today. 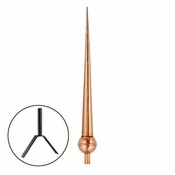 Heirloom Quality, Pure Copper Construction. 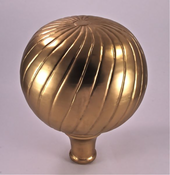 Dimensions: 18"L x 18"W x 17"H.
Includes 4” copper globe, 18”L brass directionals, and a powder coated steel rod. Roof mount required for rooftop installation. Good Directions Roof Mount (#404) sold separately. No mount needed for installation in a Good Directions cupola. Dimensions: 18"L x 18"W x 31"H.
Dimensions: 18"L x 18"W x 32"H.
Dimensions: 18"L x 18"W x 44"H.
Dimensions: 18"L x 18"W x 43"H.
Roof Mount for use with all Finials and Finial Caps. 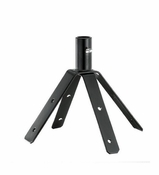 Can be used as a 2-sided or 4-sided mount. Dimensions: 6.25"L x 6"H x 7"W.